Germany's regulations and bureaucratic procedures can be a difficult hurdle for companies wishing to enter the market and require close attention by U.S. exporters. Complex safety standards, not normally discriminatory but sometimes zealously applied, complicate access to the market for many U.S. products. U.S. suppliers are well advised to do their homework thoroughly and make sure they know precisely which standards apply to their product and that they obtain timely testing and certification. Information on agricultural trade barriers can be found at the following website: http://www.usda-eu.org/. To report existing or new trade barriers and get assistance in removing them, contact either the Office of Trade Agreements Negotiations and Compliance or the U.S. Mission to the European Union. The TARIC (Tarif Intégré de la Communauté), is available to help determine if a license is required for a particular product. Moreover, the European Commission maintains an export helpdesk with information on import restrictions of various products. 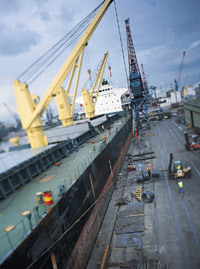 Many EU member states maintain their own list of goods subject to import licensing. For example, Germany's "Import List" (Einfuhrliste) includes goods for which licenses are required, their code numbers, any applicable restrictions, and the agency that will issue the relevant license. The Import List also indicates whether the license is required under German or EU law. The official model for written declarations to customs is the Single Administrative Document (SAD). The SAD describes goods and their movement around the world and is essential for trade outside the EU, or of non-EU goods. Goods brought into the EU customs territory are, from the time of their entry, subject to customs supervision until customs formalities are completed. Goods are covered by a Summary Declaration which is filed once the items have been presented to customs officials. The customs authorities may, however, allow a period for filing the Declaration which cannot be extended beyond the first working day following the day on which the goods are presented to customs. the person in whose name the person referred to above acted. The Summary Declaration can be made on a form provided by the customs authorities. However, customs authorities may also allow the use of any commercial or official document that contains the specific information required to identify the goods. The SAD serves as the EU importer's declaration. It encompasses both customs duties and VAT and is valid in all EU member states. The declaration is made by whoever is clearing the goods, normally the importer of record or his/her agent. European Free Trade Association (EFTA) countries including Norway, Iceland, Switzerland, and Liechtenstein also use the SAD. Information on import/export forms is contained in Council Regulation (EEC) No. 2454/93, which lays down provisions for the implementation of the Community Customs Code (Articles 205 through 221). Articles 222 through 224 provide for computerized customs declarations and Articles 225 through 229 provide for oral declarations. Regulation (EC) No 450/2008 laying down the Community Customs Code (so-called the “Modernized Customs Code”) aimed at the adaptation of customs legislation and at introducing the electronic environment for customs and trade. This Regulation entered into force on June 24, 2008 and was due to be applicable once its implementing provisions were in force by June 2013. However, the Modernized Customs Code was recast as a Union Customs Code (UCC) before it became applicable. The Union Customs Code (UCC) Regulation entered into force in October 2013 and repealed the MCC Regulation. Its substantive provisions went into effect on May 1st 2016. Terms of delivery and Payment. In addition, a certificate of origin may be required in some cases. Import duties and taxes are subject to change and companies are well advised to verify the correct tariff level shortly before carrying out any export transaction. For further information, including current customs tariffs, please go online. Since July 1, 2009, all companies established outside of the EU are required to have an EORI number if they wish to lodge a customs declaration or an Entry/Exit Summary declaration. All U.S. companies should use this number for their customs clearances. An EORI number must be formally requested from the customs of the specific member state to which the company exports. Member state custom authorities may request additional documents to be submitted alongside a formal request for an EORI number. Once a company has received an EORI number, it can use it for exports to any of the 28 EU member states. There is no single format for the EORI number. Once an operator holds an EORI number s/he can request the Authorized Economic Operator (AEO: see below under “MRA”) status, which can give quicker access to certain simplified customs procedures. More information about the EORI number can be found online. Since 1997, the U.S. and the EU have had an agreement on customs cooperation and mutual assistance in customs matters. For additional information, please go online. In 2012 the United States and the EU signed a new Mutual Recognition Arrangement (MRA) aimed at matching procedures to associate one another’s customs identification numbers. The MCC introduced the Authorized Economic Operator (AEO) program (known as the “security amendment”). This is similar to the United States’ voluntary Customs-Trade Partnership Against Terrorism (C-TPAT) program in which participants receive certification as a “trusted” trader. AEO certification issued by a national customs authority and is recognized by all member state’s customs agencies. As of April 17, 2017 an AEO can consist of two different types of authorization: “customs simplification” or “security and safety.” The former allows for an AEO to benefit from simplification related to customs legislation, while the latter allows for facilitation through security and safety procedures. Shipping to a trader with AEO status could facilitate an exporter’s trade as its benefits include expedited processing of shipments, reduced theft/losses, reduced data requirements, lower inspection costs, and enhanced loyalty and recognition. Under the revised Union Customs Code, in order for an operator to make use of certain customs simplifications, the authorization of AEO becomes mandatory. The United States and the EU recognize each other’s security certified operators and will take the respective membership status of certified trusted traders favorably into account to the extent possible. The favorable treatment provided by mutual recognition will result in lower costs, simplified procedures and greater predictability for transatlantic business activities. The newly signed arrangement officially recognizes the compatibility of AEO and C-TPAT programs, thereby facilitating faster and more secure trade between U.S. and EU operators. The agreement is being implemented in two phases. The first commenced in July 2012 with the U.S. customs authorities placing shipments coming from EU AEO members into a lower risk category. The second phase took place in early 2013, with the EU re-classifying shipments coming from C-TPAT members into a lower risk category. The U.S. customs identification numbers (MID) are therefore recognized by customs authorities in the EU, as per Implementing Regulation 58/2013 (which amends EU Regulation 2454/93 cited above). Additional information on the MRA can be found online. There is a broad array of EU legislation pertaining to the marking, labeling and packaging of products, with neither an “umbrella” law covering all goods nor any central directory containing information on marking, labeling and packaging requirements. This overview is meant to provide the reader with a general introduction to the multitude of marking, labeling and packaging requirements or marketing tools to be found in the EU. The first step in investigating the marking, labeling and packaging legislation that might apply to a product entering the EU is to draw a distinction between what is mandatory and what is voluntary. Decisions related to mandatory marking, labeling and/or packaging requirements may sometimes be left to individual Member States. Furthermore, voluntary marks and/or labels are used as marketing tools in some EU Member States. This report is focused primarily on the mandatory marks and labels seen most often on consumer products and packaging, which are typically related to public safety, health and/or environmental concerns. It also includes a brief overview of a few mandatory packaging requirements, as well as more common voluntary marks and/or labels used in EU markets. It is also important to distinguish between marks and labels. A mark is a symbol and/or pictogram that appears on a product or its respective packaging. These range in scope from signs of danger to indications of methods of proper recycling and disposal. The intention of such marks is to provide market surveillance authorities, importers, distributors and end-users with information concerning safety, health, energy efficiency and/or environmental issues relating to a product. Labels, on the other hand, appear in the form of written text or numerical statements, which may be required but are not necessarily universally recognizable. Labels typically indicate more specific information about a product, such as measurements, or an indication of materials that may be found in the product (such as in textiles or batteries). Voluntary and mandatory marks and labels apply to all Member States of the EU, countries in the European Economic Area, European Free Trade Association, as well as candidate countries seeking membership to the EU. For each “New Approach” directive there is a separate list of references to harmonized European standards, the use of which provides the manufacturer with the ‘presumption of conformity’ with essential requirements. While other non-EU standards may be used to demonstrate a product’s compliance with the applicable directive(s), the manufacturer will have to provide detailed information regarding the compliance process. An array of standardized safety warning symbols/pictograms may also be applicable to each of the above product categories. In 2008, the EU adopted a package of measures known as the New Legislative Framework which provides a regulatory ‘toolbox’ for new and revised EU product safety legislation. The framework is designed to improve market surveillance, more clearly define the responsibilities of manufacturers, importers and distributors, and clarify the meaning of CE marking across a wide-range of product groups. In February 2014, to align product harmonization legislation with the provisions of the NLF (most notably Decision 768/2008), the European Union adopted an "Alignment Package" consisting of eight revised CE marking directives. These newly aligned directives will be applicable in 2016. The symbol shown above must be displayed on all products that fall under this directive, and indicates that the product is not to be discarded with normal household waste. It is a required mark on batteries. In instances where this symbol cannot be displayed on the equipment itself, it should be included on the packaging. Directive 2010/30/EU “on the indication by labeling and standard product information of the consumption of energy and other resources by energy-related products” sets a framework for the adoption of product-specific directives on the proper energy efficiency labeling for each concerned product. This 2010 directive broadens substantially the energy labeling scope. Suppliers are to supply free of charge labels or product fiches containing information about consumption of electric or other energy sources to their dealers. Dealers display labels in a visible and legible way and make the fiche available in product brochure or other literature. In addition to applying a CE marking for products falling under the ATEX Directive (2014/34/EC), it is necessary to display the Ex mark, which is a specific marking of explosion protection. Located next to the ‘Ex’ mark will be a symbol designating the product group or category as specified in the directive. The revised ATEX Directive (2014/34/EC) was adopted in February 2014 as part of the New Legislative Framework alignment package. It replaced the existing directive and became applicable on April 20, 2016. Machines used outdoors are subject to CE marking requirements. Noise emission levels are covered separately. 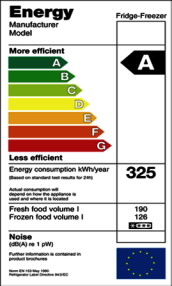 The sample mandatory label shown above specifies noise emission levels. A revised Marine Equipment Directive (2014/90/EC) was adopted in July 2014 and will be applicable on September 18, 2016. Textile products must be labeled or marked whenever they are put onto the market for production or commercial purposes (sale). The names, descriptions and details of a textile’s fiber content must be indicated on products available to consumers. With the exception of trademarks or the name of the undertaking, information other than that required by the directive must be listed separately. Member States may require that their national language be used on the labeling and marking required by the directive. Labels must convey information relating to the upper, the lining and insole sock, and the outer-sole of the footwear article. The information must be conveyed by means of approved pictograms or textual information, as defined by the directive. The label must be legible, firmly secured and accessible, and the manufacturer or his authorized agent established in the Community is responsible for supplying the label and for the accuracy of the information contained therein. Only the information provided for in the directive need be supplied. There are no restrictions preventing additional information being included on the label. The Member States are to draw up procedures for providing the information set out above in the case of cosmetic products that have not been pre-packaged. The product function and list of ingredients also have to appear on the container or packaging. Member States may stipulate that the information on the label is provided in their national or official language(s). The Cosmetics regulation indicates that from July 2013 “all ingredients present in the form of nanomaterials shall be clearly indicated in the list of ingredients” and that “the names of such ingredients shall be followed by the word ‘nano’ in brackets”. Market Research Report on "EU Cosmetics Legislation"
A reference to the special risks arising from such dangers. The dimensions of the label must not be less than a standard A8 sheet (52 x 74mm), and each symbol must cover at least one-tenth of the label’s surface area. Member States may require their national language(s) to be used in the labeling of dangerous substances. Where the packaging is too small, the labeling may be affixed in some other manner. The packaging of products considered dangerous which are neither explosive nor toxic may go unlabeled if the product contains such small quantities of dangerous substances that there is no danger to users. Symbols must be employed if the substance can be defined as any one of the following (as shown above): explosive, oxidizer, flammable, harmful, toxic irritant, corrosive, or harmful to environment. Containers of hazardous substances should include, in addition to the appropriate symbols, a raised triangle to alert the vision-impaired to their contents. Note that this directive has undergone numerous amendments relating, amongst other things, to the marking and labeling of additional substances. Accordingly, it is advisable to consult all literature. Regulation 1272/2008 implements the classification, labeling and packaging requirements for chemicals based on the Worldwide United Nation’s Globally Harmonized System (UN GHS). This legislation specifies permissible ranges of nominal quantities, container capacities and the weights or volumes of prepackaged products. Manufacturers are advised to take note that all labels require metric units, although dual labeling is also acceptable. The directive requires an indication of the selling price, and price per unit of measurement, on all products offered to consumers. The aim is to improve the information available to the consumer and to facilitate price comparison. This information must be unambiguous, clearly legible and easily identifiable. If advertising mentions the item’s selling price, it must also indicate its unit price. For products sold in bulk, the unit price is the only item whose indication on the label is mandatory. National authorities may provide alternatives for products sold by small retail business operations. Directive 98/6/EC on the indication of the prices of products offered to consumers. A similar marking is an ‘E’ surrounded by a circle, which applies to the testing of headlight lamps, brake light lamps and turning signal lamps of all vehicles seeking EU market entry. These include consumer vehicles, low-volume production trucks, light and heavy goods vehicles, trailers, motorcycles, cranes, agriculture and forestry tractors, and special-purpose and off-road vehicles. Tire label legislation requires that tire manufacturers declare fuel efficiency, wet grip and external rolling noise performance of C1, C2 and C3 tires (i.e. tires mainly fitted on passenger cars, light and heavy duty vehicles). The objective of the regulation is better information for the consumer and a contribution to a more energy efficient transport policy. The EU Packaging and Packaging Waste Directive harmonized member state legislation regarding packaging material composition and the management of packaging waste. Composition of packaging material is addressed in a series of EU-wide standards. For the management of packaging waste through recycling targets and collection and recycling systems, Member States have adopted voluntary marking mentioned in the following pages. Like the United States, the EU has adopted legislation to ensure pest control in wood packaging. The marking used for regulated materials is based on the International Plant Protection Convention compliance symbol shown above. Manufacturers of containers, plates, cups, and other material that is intended to come into contact with food are required to check the compliance of their product with EU chemical safety requirements. Using the symbol shown above shows compliance with these requirements. It is mandatory to comply with the legislation, but the use of the symbol is voluntary. The e-mark, shown above, acts as a metrological "passport" to facilitate the free movement of prepackaged goods. It guarantees that certain liquids and other substances have been packed by weight or volume in accordance with the directives. While compliance is not mandatory, free movement throughout the EU is guaranteed for prepackaged products that do comply with the provisions of the directive. Containers with an e-mark also bear an indication of the weight or volume of the product, known as its “nominal” weight or volume. The packer (or importer, if the container is produced outside the EU) is responsible for ensuring that the containers meet the directive’s requirements. The European Eco-label enables European consumers, including public and private purchasers, to easily identify officially approved green products across the European Union, Norway, Liechtenstein and Iceland. Introduced in 1992, the label communicates to the customer that the marked products meet specific eco-friendly criteria that have been developed to apply to everyday consumer goods and services. Manufacturers should be aware that similar eco-friendly markings are often used nationally, such as the Nordic Swan or the German Blue Angel, shown below. The Eco-label program has recently been expanded to cover fish and fishery products. This means that eco-labeled products have been produced in accordance with specific environmental standards. The European Commission is currently preparing, at the request of the European Parliament and the Council, a feasibility report on options for a Union-wide eco-label scheme for fishery and aquaculture products. Some EU Member States have already created their own National eco label. The “mobius loop” (sometimes known as the “chasing arrows”), based on an international standard, may be found on products throughout Europe and is meant to help consumers identify and participate in recycling schemes for product packaging and materials. As well as being used on printed packaging, the chasing arrows symbol is sometimes featured in the molds of glass, metal, paper, or plastic products. Various kinds of loops indicate whether the product is recyclable, recycled or contains recycled material. There are no EU-wide symbols used to designate the recyclable nature of glass. However, it is certainly encouraged on the national level with an array of symbols. The one shown above is just one small sample of the total existing to show recyclability. The Green Dot system is a scheme in which participating bodies coordinate the collection, sorting and recovery of used packaging. This system is actually administered according to national packaging laws (adhered to by packaging manufacturers, fillers, retailers and importers), and it should be noted that all participating national systems operate independently. The umbrella organization, PRO-Europe, is responsible for managing the Green Dot labeling system in Europe. More than 460 billion pieces of packaging marked with the Green Dot, shown above, are distributed worldwide. Interested applicants should contact one of the national administering authorities. The U.S. Department of Commerce’s Bureau of Industry and Security (BIS) is responsible for implementing and enforcing the Export Administration Regulations (EAR), which regulate the export and re-export of some commercial items, including “production” and “development” technology. BIS has developed a list of "red flags," or warning signs, intended to discover possible violations of the EAR. The list can be found in the "Know Your Customer" guidance document. The EAR does not control all goods, services, and technologies. Other U.S. government agencies regulate more specialized exports. For example, the U.S. Department of State has authority over defense articles and services. A list of other agencies involved in export control can be found on the BIS website. It is important to note that in August 2009 a broad-based interagency review of the U.S. export control system was initiated, with the goal of strengthening national security and the competitiveness of key U.S. manufacturing and technology sectors by focusing on current threats, as well as adapting to the changing economic and technological landscape. As a result, the Administration launched the Export Control Reform Initiative (ECR Initiative) which is designed to enhance U.S. national security and strengthen the United States’ ability to counter threats such as the proliferation of weapons of mass destruction. The reform is being implemented in three phases. Phases I and II reconcile various definitions, regulations, and policies for export controls, all the while building toward Phase III, which will create a single control list, single licensing agency, unified information technology system, and enforcement coordination center. For further details about the Bureau of Industry and Security and its programs, please visit the BIS website. Specific information on the ATA Carnet Customs procedure used for temporary importation, transit and temporary admission of goods designed for specific purposes, duty-free and tax-free (such as professional equipment for presentations or trade fairs). Alternatively, search the Commerce Department’s Market Research Library, available from: Market Intelligence under Country and Industry Market Reports. For information on how to access the TARIC, see the Import Requirements and Documentation Section. The Union Customs Code (UCC) was adopted in 2013 and its substantive provisions apply from 1 May 2016. It replaces the Community Customs Code (CCC). In addition to the UCC, the European Commission has published delegated and implementing regulations on the actual procedural changes. These are included in Delegated Regulation (EU) 2015/2446, Delegated Regulation (EU) 2016/341 and the Implementing Regulation (EU) 2015/2447. Customs Valuation – Most customs duties and value added tax (VAT) are expressed as a percentage of the value of goods being declared for importation. Thus, it is necessary to dispose of a standard set of rules for establishing the goods' value, which will then serve for calculating the customs duty. These objectives are met using a single instrument - the rules on customs value. The EU applies an internationally accepted concept of ‘customs value’. The value of imported goods is one of three 'elements of taxation' that provides the basis for assessment of the customs debt, which is the technical term for the amount of duty that has to be paid, the other ones being the origin of the goods and the customs tariff. Products tested and certified in the United States to U.S. regulations and standards are likely to have to be retested and re-certified to EU requirements as a result of the EU’s different approach to the protection of the health and safety of consumers and the environment. Where products are not regulated by specific EU technical legislation, they are always subject to the EU’s General Product Safety Directive as well as to possible additional national requirements. European Union legislation and standards created under the New Approach are harmonized across the Member States and European Economic Area countries to allow for the free flow of goods. An example of the New Approach is CE marking. The concept of New Approach legislation is slowly disappearing as the New Legislative Framework (NLF), which entered into force in January 2010, was put in place to serve as a blueprint for existing and future CE marking legislation. Existing legislation has been reviewed to bring them in line with the NLF concepts, which means that, as of 2016, new requirements are being addressed and new reference numbers are to be used on declarations of conformity. For more information about the NLF. While harmonization of EU legislation can facilitate access to the EU Single Market, manufacturers should be aware that regulations (mandatory) and technical standards (voluntary) might also function as barriers to trade if U.S. standards are different from those of the European Union. EU standards setting is a process based on consensus initiated by industry or mandated by the European Commission and carried out by independent standards bodies, acting at the national, European or international level. There is strong encouragement for non-governmental organizations, such as environmental and consumer groups, to actively participate in European standardization. Standards are created or modified by experts in Technical Committees or Working Groups. The members of CEN and CENELEC are the national standards bodies of the Member States, which have "mirror committees" that monitor and delegate experts to participate in ongoing European standardization. CEN and CENELEC standards are sold by the individual Member States standards bodies. ETSI is different in that it allows direct participation in its technical committees from non-EU companies that have interests in Europe and provides some of its individual standards at no charge on its website. In addition to the three standards developing organizations, the European Commission plays an important role in standardization through its funding of the participation in the standardization process of small- and medium-sized companies and non-governmental organizations, such as environmental, labor and consumer groups. The Commission also provides money to the European standards bodies when it mandates standards development for harmonized standards that will be linked to EU legislation. Mandates– or requests (the Commission requests CEN/CENELEC or ESTI to develop standards) for standards. Given the EU’s vigorous promotion of its regulatory and standards system as well as its generous funding for its development, the EU’s standards regime is wide and deep - extending well beyond the EU’s political borders to include affiliate members (countries which are hopeful of becoming full members in the future) such as the Western Balkan countries among others. Another category, called "companion standardization body" includes the standards organization of Morocco, Israel, Kazakhstan and Australia, among others which are not likely to become a CEN member or affiliate for political and geographical reasons. To view what CEN and CENELEC have in the pipeline for future standardization, it is best to visit their websites. Other than their respective annual work plans, CEN’s "what we do" page provides an overview of standards activities by subject. Both CEN and CENELEC offer the possibility to search their respective database. ETSI's portal links to ongoing activities. The European Standardization system and strategy was reviewed in 2011 and 2012. The new standards regulation 1025, adopted in November 2012, clarifies the relationship between regulations and standards and confirms the role of the three European standards bodies in developing harmonized standards (EN)1. The emphasis is also on referencing international standards where possible. For information, communication and technology (ICT) products, the importance of interoperability standards has been recognized. Through a relatively recent mechanism, a “Platform Committee” reporting to the European Commission will decide which deliverables from fora and consortia might be acceptable for public procurement specifications. The European standards bodies have been encouraged to improve efficiency in terms of delivery and to look for ways to include more societal stakeholders in European standardization. The Joint Initiative on Standardization, launched in 2016 with a number of action items to improve European standardization, involves a large group of stakeholders who are committed to deliver results by 2019. Standards are created or modified by experts in Technical Committees or Working Groups. The members of CEN and CENELEC are the national standards bodies of the Member States, which have "mirror committees" that monitor and participate in ongoing European standardization. The German organization that compiles standards is the Deutscher Industrie Normenausschuss - DIN (German Standards Institute). The DIN also compiles the standards that lay down the requirements for a "GS" mark. Since 1975, DIN has been recognized by the German government as the national standards body and represents Germany’s interests at the international and EU levels. DIN offers a forum in which interested parties meet in order to discuss and define their specific standardization requirements and to record the results as German Standards. In DIN, standard work is carried out by some 26,000 external experts, serving as voluntary delegates in more than 4,000 committees. Draft standards are published for public comment, and all comments are reviewed before final publication of the standard. Published standards are reviewed for continuing relevance at least every five years. According to DIN, standards are designed to promote rationalization, quality assurance, safety, and environmental protection, as well as improving communication between industry, technology, science, government, and the public domain. The input of external experts into standardization is organized through standards committees and working groups. Each standards committee is responsible for a distinct area of activity and coordinates the corresponding standardization work at the EU and international levels. As a rule, the standards committee in DIN includes a number of technical sub-committees. There are standards committees that maintain their own websites. Basic details of their area of activity and a list of the standards are published in English. Links to these committees are available on the German Standards Institute website. Conformity Assessment is a mandatory step for the manufacturer in the process of complying with specific EU harmonized legislation. The purpose of conformity assessment is to ensure consistency of compliance during all stages, from design to production, to facilitate acceptance of the final product. EU product legislation gives manufacturers some choice regarding conformity assessment, depending on the level of risk involved in the use of their product. These range from self-certification, type examination and production quality control system, to full quality assurance system. Conformity assessment bodies in individual Member States are listed in the New Approach Notification and Designated Organizations (NANDO) information system. To promote market acceptance of the final product, there are a number of voluntary conformity assessment programs. CEN’s certification system is known as the Keymark. Neither CENELEC nor ETSI offer conformity assessment services. To sell products in the EU market of 28 Member States as well as in EFTA (Norway, Liechtenstein Iceland, Switzerland) and Turkey U.S. exporters are required to apply CE marking whenever their product is covered by specific product legislation. CE marking product legislation offers manufacturers a number of choices and requires decisions to determine which safety/health concerns need to be addressed, which conformity assessment module is best suited to the manufacturing process, and whether or not to use EU-wide harmonized standards. The CE marking process is very complex and this section attempts to provide some background and clarification. Products manufactured to standards adopted by CEN, CENELEC or ETSI, and referenced in the Official Journal as harmonized standards, are presumed to conform to the essential requirements of EU harmonized legislation. The manufacturer then applies the CE marking and issues a declaration of conformity. With these, the product will be allowed to circulate freely within the EU and EFTA. A manufacturer can choose not to use the harmonized EU standards, but then must demonstrate that the product meets the essential safety and performance requirements. Trade barriers occur when design, rather than performance, standards are developed by the relevant European standardization organization, and when U.S. companies do not have access to the standardization process through a European presence. The CE marking addresses itself primarily to the national control authorities of the Member States, and its use simplifies the task of market surveillance of regulated products. As market surveillance was found lacking, the EU adopted the New Legislative Framework, which went into force in 2010. As mentioned before, this framework is like a blueprint for all CE marking legislation, harmonizing definitions, responsibilities, European accreditation and market surveillance. The CE marking is not intended to include detailed technical information on the product, but there must be enough information to enable the inspector to trace the product back to the manufacturer or the local contact established in the EU. This detailed information should not appear next to the CE marking, but rather on the declaration of conformity (which the manufacturer or authorized agent must be able to provide at any time, together with the product's technical file), or the documents accompanying the product. Independent test and certification laboratories, known as notified bodies, have been officially accredited by competent national authorities to test and certify to EU requirements. "European Accreditation" is an organization representing nationally recognized accreditation bodies. Membership is open to nationally recognized accreditation bodies in countries in the European geographical area that can demonstrate that they operate an accreditation system compatible to appropriate EN and ISO/IEC standards. Official Journal of the EU is the official publication of the European Union. It is published daily on the internet and consists of two series covering adopted legislation as well as case law, studies by committees. It also lists the standards reference numbers linked to legislation (Harmonized Standards). National technical regulations are published on the Commission's website to allow other countries and interested parties to comment. Technical regulations are published by the publishing house of DIN, Beuth Verlag. Member countries of the World Trade Organization (WTO) are required under the Agreement on Technical Barriers to Trade (TBT Agreement) to report to the WTO all proposed technical regulations that could affect trade with other Member countries. The Notify U.S. Service is a free, web-based e-mail subscription service that offers an opportunity to review and comment on proposed foreign technical regulations that can affect your access to international markets. Register online at Internet URL: Notify U.S. The recognition of skills and qualifications acquired by EU citizens in EU Member States, including the corresponding recognition procedures and charges are, in correspondence with article 165 of the TFEU, the responsibility of Member States. Similarly, recognition of skills and qualification earned in third countries is also a national responsibility. Recognition of professional qualifications obtained in one Member State for the purposes of access and pursuit of regulated professions in another Member State is subject to Directive 2005/36. Recognition of qualifications for academic purposes in the higher education sector, including school-leaving certificates is subject to the Lisbon Recognition Convention. The ENIC-NARIC network provides advice on (cross-border) recognition of these qualifications. Recognition in other cases is assessed and granted (or denied) by the receiving educational provider or employer. For them to be able to recognise skills and qualifications an understanding of the level, content and quality is needed. The Commission currently explores the possibilities on how to better support these recognition decisions. The “Your Europe” website maintains a webpage dedicated to help citizens identify what the regulated professions are and what document are needed for their recognition in each Member State. Please see: Recognition of Professional Qualification.